Collectors frequently sell old Sinclair products on eBay.co.uk. Click the "GO" button on the left to find any Sinclair PC500s being auctioned. 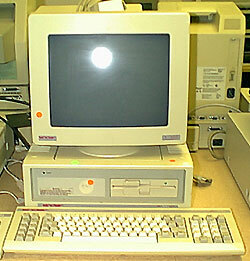 Like the PC200, the PC500 appears to have been an existing Amstrad product - probably the PC 1640, released in 1986 - rebadged with the Sinclair label. It also appears to have met with an equal lack of commercial success and is now exceptionally rare.